Rachel Dolezal is back and again capitalizing on her bizarre transracial antics or reverse-passing situation or whatever you want to call it. 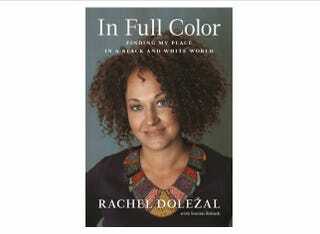 Online retailer Amazon.com is taking preorders for her new book, In Full Color: Finding My Place in a Black and White World. With In Full Color, Rachael Doležal describes the path that led her from being a child of white evangelical parents to an NAACP chapter president and respected educator and activist who identified as black. Along the way, she’ll discuss the deep emotional bond she formed with her four adopted black siblings, the sense of belonging she felt while living in black communities in Jackson, Mississippi and Washington, D.C., and the discrimination she’s suffered while living as a black woman. In Full Color drops March 28, 2017.